The new Parabellum Sport Touring windshield for the 2016-On Triumph Street Twin makes the already amazingly fun bike even more ride-able by improving comfort and reducing wind noise while increasing fuel economy without distracting from the motorcycle‘s classic styling. You will be making excuses and finding reasons to take the long way home from work adding miles where ever you can. 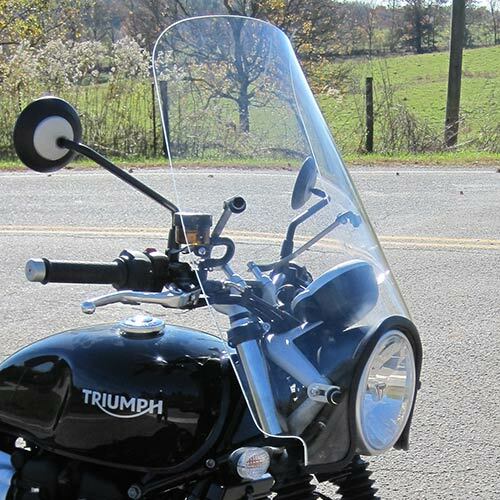 With a plethora of happy 1st generation Bonneville customers we used a similar design that gives the same protection and performance as the Parabellum windshield before it. 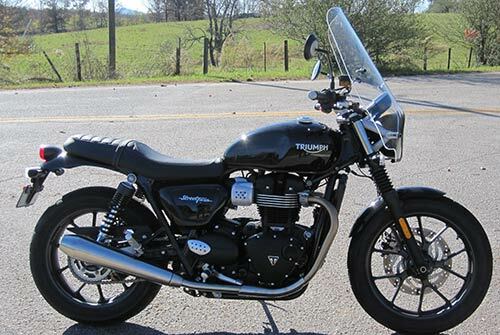 Our new Triumph Street Twin Sport Touring Windshield mounts easily with provided hardware to the handlebar clamps and headlight bolts and is made of 3/16 inch military grade cast acrylic. It is 19.5 inches wide and available in 3 heights and in clear or tint.